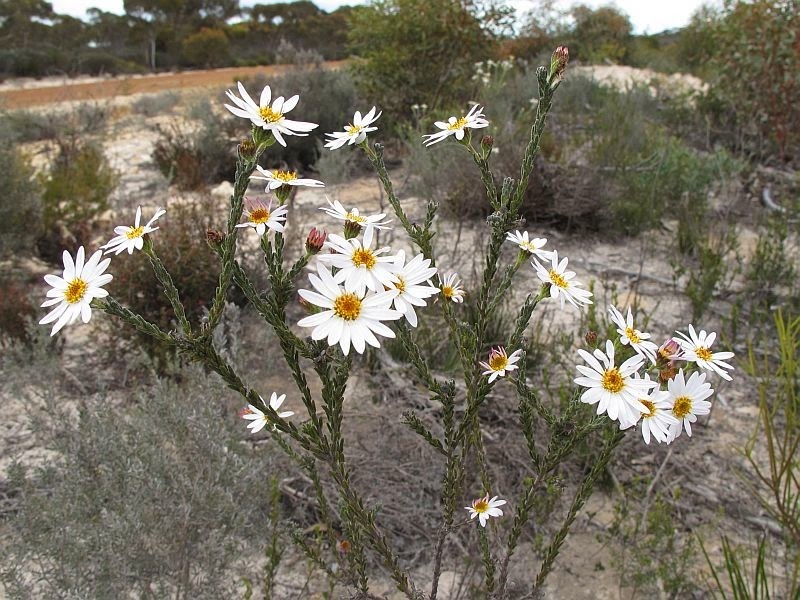 The Rough-leaved Daisy Bush is an upright open shrub, growing to a little over a metre (4’) in height and locally, with large white petalled flowers (pink blush on the underside). Each petal is an individual flower, as are the numerous small central golden/yellow flowers (disc florets) and every miniature flower is capable of producing a single achene (seed), which may be carried on the wind by the pappus (tuft of hairs) that are attached to it. 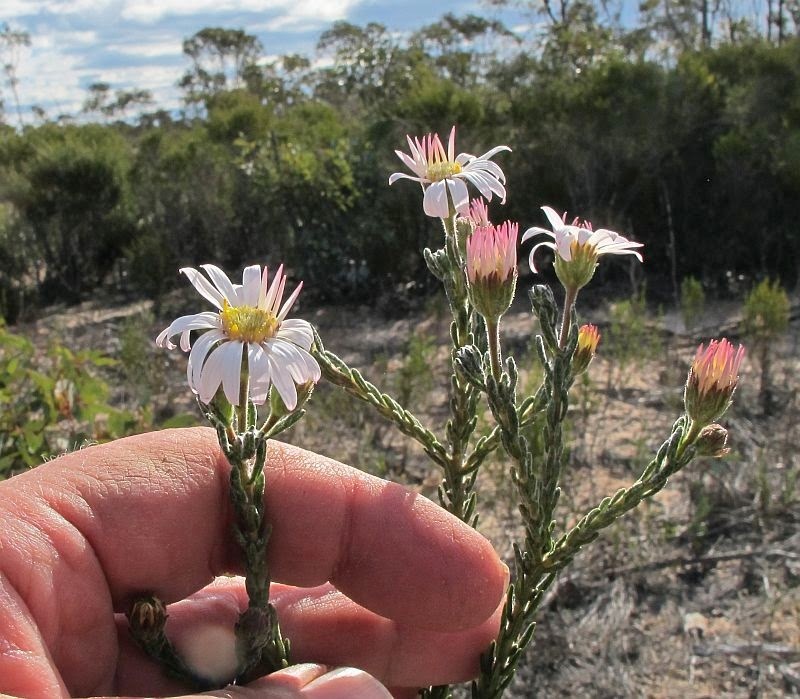 Olearia muricata is endemic to WA and has a range from Mullewa (east of Geraldton) to Albany and from there to Cape Arid (east of Esperance), to return to Mullewa via Southern Cross. 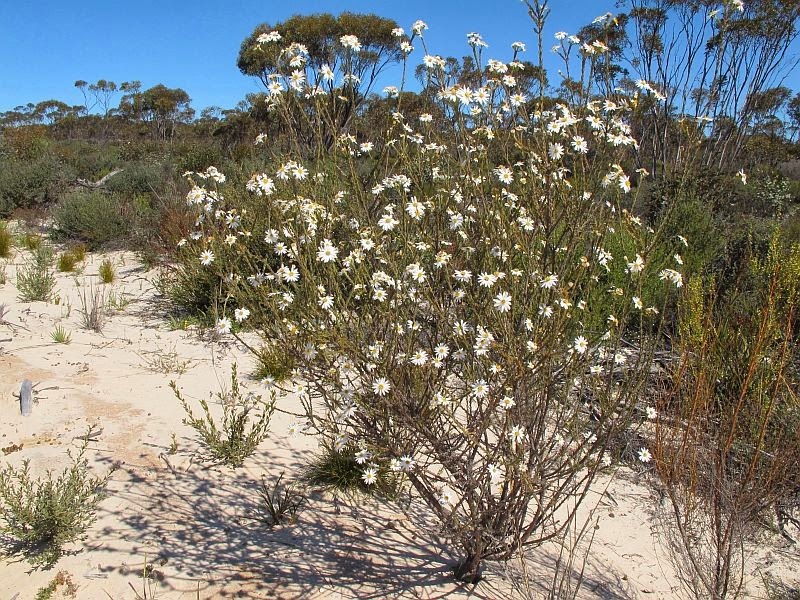 It is quite common in the inland mallee region around Esperance, although usually as individual plants or small colonies where it favours deepish (disturbed) sandy soils, over clay, gravel, granite or limestone. 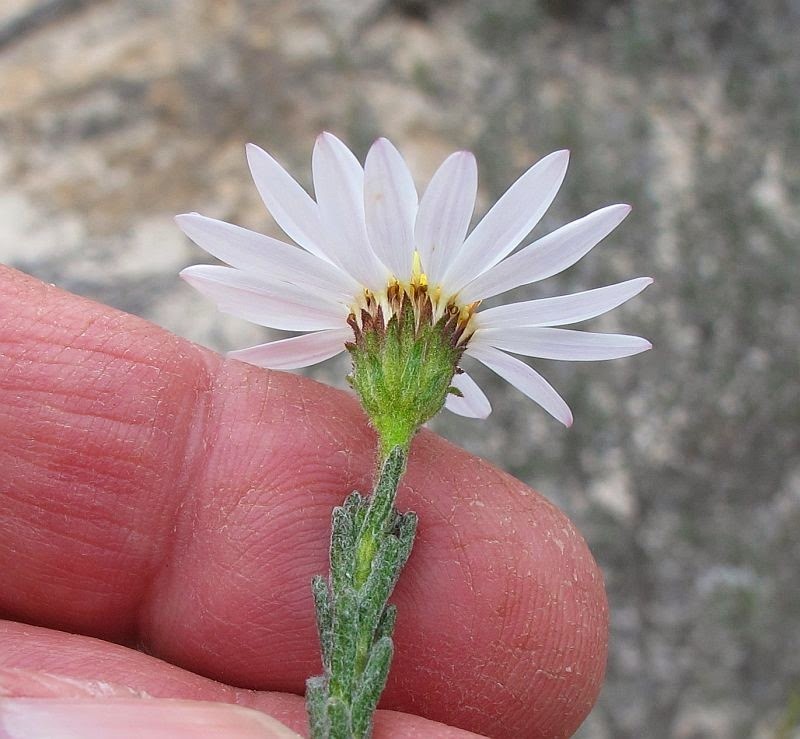 This species can be tricky to key out, as some can lead to another species namely Olearia adenolasia, the Woolly-glandular Daisy-bush, of which some features appear to be transposed. However that species seldom exceeds half the height of O. muricata, and tends to be bushier and generally has blue flowers (less so white). 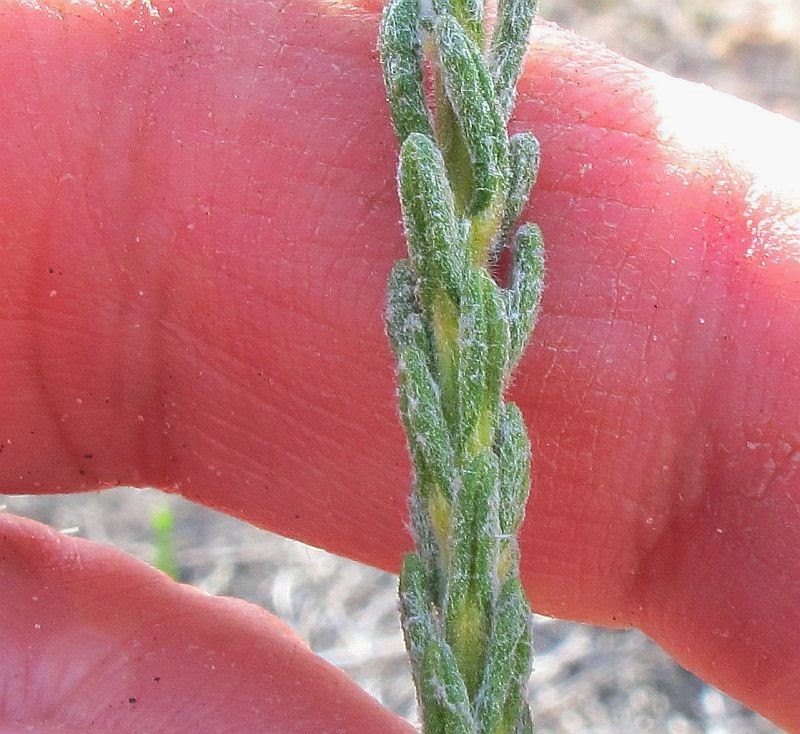 The foliage is also confusing as O. muricata can be quite woolly too, but has short hard points projecting at right angles from the upper leaf surface (not easily seen in the photographs), from where the species name originates (muricate). Even more pronounced are the long dense stout hairs growing at right angles from the stem, but despite all these projections the plant is only mildly rough to the touch. 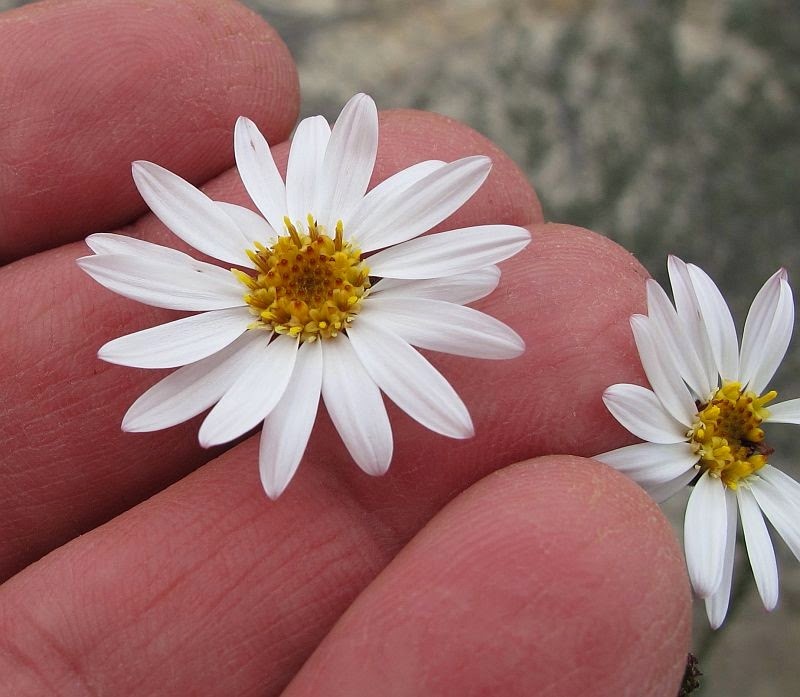 The flowers are over 3 cm (to 11/4”) diameter and can bloom (depending on local weather conditions) for most of the year. 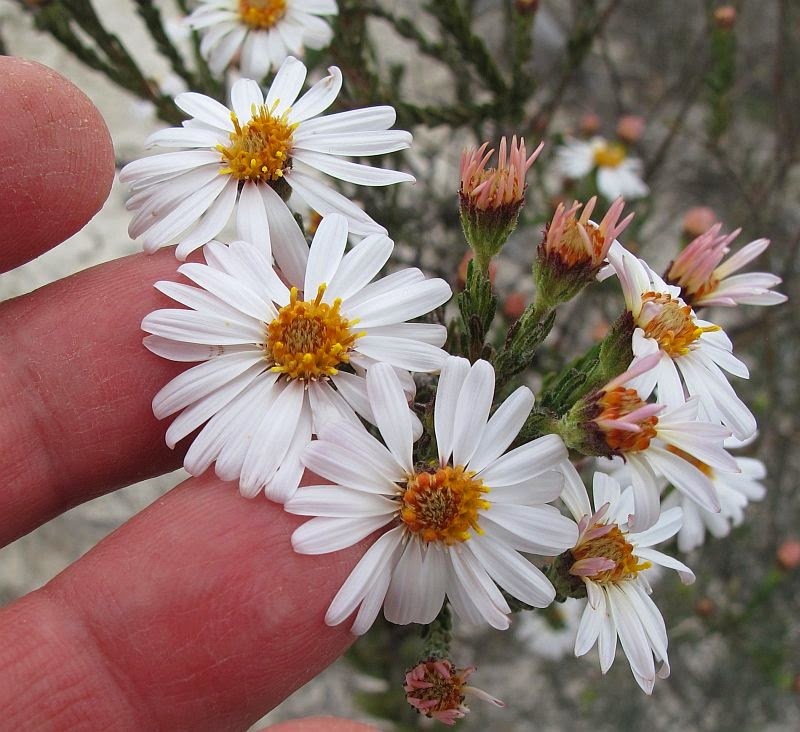 However these locally white/yellow flowers maybe blue/purple elsewhere, which is probably another reason for the confusion of this species in some keys. 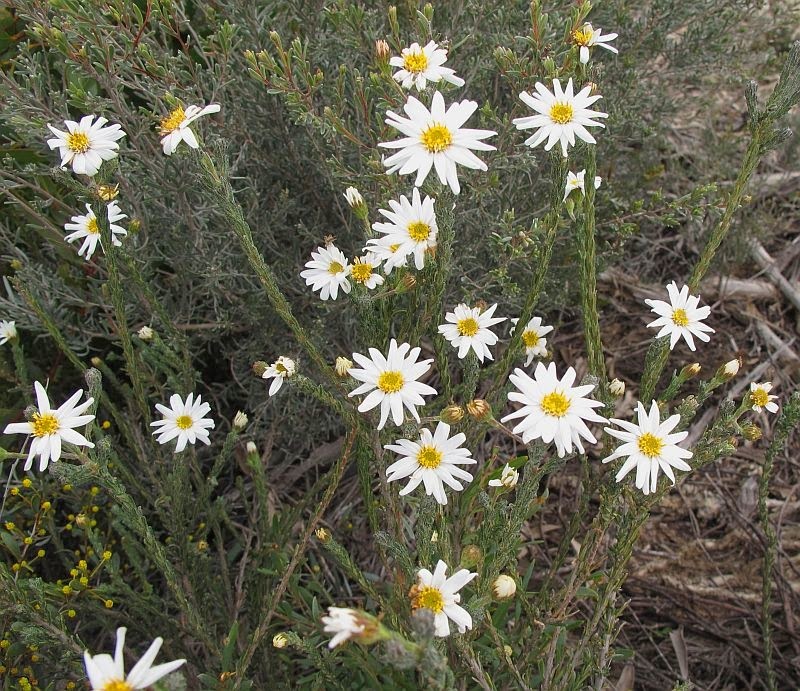 The Olearia genus contains many tree and shrub species and is part of the very large and highly diverse worldwide daisy family, Asteraceae.